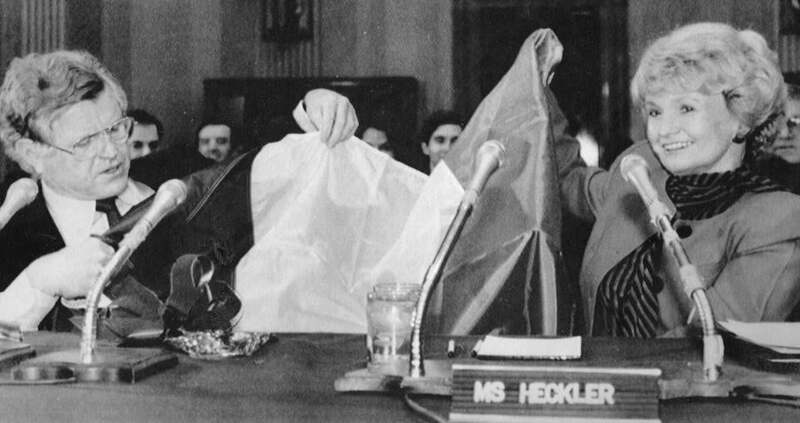 Senator Edward Kennedy gave Ms. Heckler, his former colleague, an Irish flag at her confirmation hearing as ambassador. 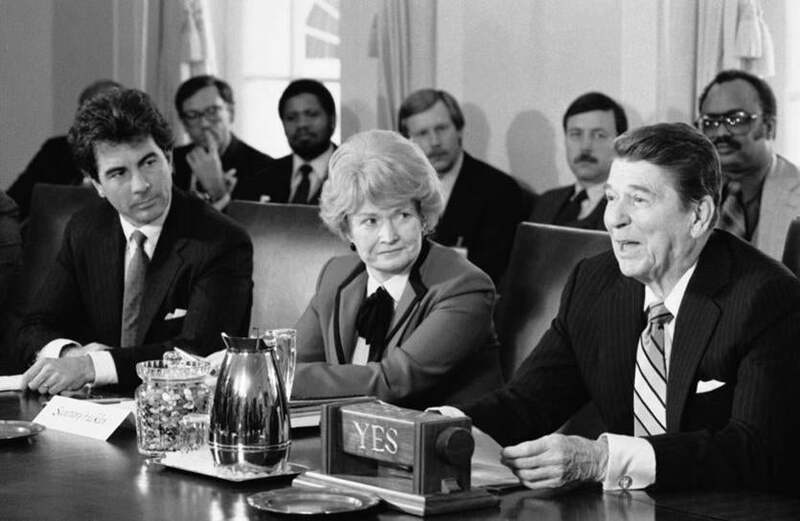 After that defeat, Ms. Heckler was nominated by President Reagan to be health and human services secretary and received near-unanimous confirmation by the Senate. In that role, she found herself on the front lines of the AIDS epidemic as it ballooned from an overlooked and underreported problem into a national public health crisis. Margaret Mary O’Shaughnessy was born in Flushing, N.Y., to a father who worked as a hotel doorman and a mother who also emigrated from Ireland. She graduated in 1953 from Albertus Magnus College in New Haven, Conn., and married investment banker John Heckler the following year. They moved to the Boston area in part so she could attend BC. In 1962, she became the first woman elected to the Massachusetts Governor’s Council, which approves judicial appointments, where she helped lay the political groundwork for her congressional career. In 1966, Mrs. Heckler bucked the Republican establishment by challenging 42-year incumbent US Representative Joseph Martin Jr., a two-time House speaker, then shocked the political world by defeating him in the primary by 3,200 votes. She topped labor lawyer Patrick Harrington Jr., her Democratic opponent, in the general election. Over the next 16 years in Congress, Ms. Heckler developed a reputation as someone unafraid to speak her mind but also impatient with the often-cumbersome process of making laws. Representative Richard Neal of Springfield, the dean of the Massachusetts congressional delegation, described Ms. Heckler as a hands-on member of the House who also paid great attention to detail as health and human services secretary. “She was on the cutting edge of women making their way to the political system,” Neal said. Ms. Heckler served on the Committee on Veterans Affairs during her entire House tenure, helping “those who ‘had the most to lose’ while defending our country,” her family said. Other assignments included the Banking and Agricultural committees during a restless congressional career dotted by repeated speculation that she would pursue statewide office in Massachusetts. She was also known for her work as the author of the Equal Credit Opportunity Act, which in 1974 made it illegal to discriminate against women and others in granting credit. Ms. Heckler at a 1985 meeting with President Reagan. A moderate Republican from a liberal state, Ms. Heckler often was viewed with suspicion by more conservative members of her party. She also drew fire from women’s groups over her opposition to the use of federal funds for abortion. The fallout was significant, even though Ms. Heckler did not support adding a pro-life amendment to the Constitution or requiring federally funded clinics to notify parents that teenage children had received birth control prescriptions. Ms. Heckler did not receive some endorsements from the National Organization for Women. Ms. Heckler gained a reputation as someone willing to flout unwritten rules. “Four days into her first term, Heckler ignored the chamber’s tradition that freshman members remain silent when she publicly demanded the release of a constituent, a naturalized citizen, who had been arrested for espionage in Czechoslovakia,” the biography said. She also advocated for her constituents, “calling for an end to foreign oil import quotas in order to gain cheaper fuel oil, protecting the New England textile industry, demanding protection of US fishermen from Soviet harassment on the seas, and calling for tax credits to help parochial schools,” the biography added. After eight terms in the House, Ms. Heckler appeared to be a solid favorite in her 1982 race against Frank. Although both candidates were incumbents, the newly configured Fourth Congressional District appeared to favor Ms. Heckler geographically. But Frank attacked Heckler for being a “Reagan clone,” particularly on tax cuts, despite her record of opposing the president many times. The strategy worked. Frank defeated her, 59 percent to 40 percent, in a startling conclusion to her congressional career. As health and human services secretary, she faced an expanding AIDS crisis. “She was the secretary who announced HIV as a major health problem,” Delgado said. Her advocacy was guided by her Catholic faith, Delgado said. Following lingering complaints from some Republicans about her management of the department, Reagan offered her the position of US ambassador to Ireland, which she filled until 1989. Ms. Heckler leaves three children, Alison, Belinda, and John. Her marriage ended in divorce. A funeral Mass will be said at 10 a.m. Aug. 25 at the Cathedral of St. Matthew the Apostle in Washington, D.C.
Brian MacQuarrie can be reached at brian.macquarrie@globe.com. Travis Andersen can be reached at travis.andersen@globe.com. Follow him on Twitter @TAGlobe.